I know this is a bit late for St. Stephen's feast day, but kids don't care if you are a little late (or early)! So feel free to celebrate his feast day this week! St. Stephen was a great preacher who spoke strong words for Jesus. His words angered many people, and so they drug him out of the city and stoned him to death. St. Stephen's was the very first martyr and so he was blessed to have his feast day on the day after Christmas.(Dec. 26) You can read his story is in the Bible in the Book of Acts 6 - 7. So look it up and have a read! Or click here to see it on-line. 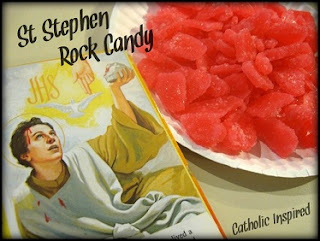 For St. Stephen's feast day we made rock candy. The stones that killed St. Stephen were hard, sharp, and painful, but they brought St. Stephen to a sweet life in heaven! Our rock candy is hard and sharp, but it's also sweet. Many saints have shown us that a life lived for Jesus is a hard life, but it's a sweet end, and this candy is much the same! So remember that through hardship and pain we can reach the sweet life in heaven! Mix the sugar and water together in a sauce pan. Heat it on high until the sugar dissolves and begins to boil. After it has come to a boil, continue to let it boil for about 3 minutes. 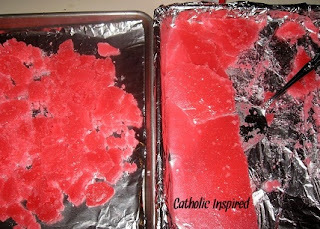 Remove the pan from the heat and mix in the vanilla extract and food coloring. This rock candy can be used for other Saints feast day's as well - Barnabas and Philip were also stoned to death.